Come 1985 Eagles I were again in contention for championship honors but, as reported in the headline of a basketball article that appeared in The New Chronicle of 16th August 1985, 'Eagles Wings Emphatically Clipped' in their flight for the 1985 Division I League championship, having been blown-out by Cardinals, 69-92 in their final match. However, again they placed 2nd overall, among the 10 Division I teams in the Round-Robin 2-round League competition that year. In Eagles I third year (1985) they inflicted four blow-outs, all centuries. They destroyed Green City 106-48; massacred Lions 106-59; chalked up a second century against Lions 108-65; and crushed SMAGs 118 Pts to 71. 1985 also saw Eagles soaring up to the Knock-out Finals, against rivals Cardinals. However, as a result of a 'long-distance' foul-call being made against an Eagles player in the second half of that game, the game ball ended up being kicked into a swollen Roseau River by that player. That encounter ended prematurely at 66-55 (Cardinals). Cardinals were awarded the 1985 championship. And the kicker, who was one of the top-scorers in that year's Division I League competition was subsequently slapped with a suspension. The year 1986, however, was a very productive one for Eagles I as they plundered their way through the seven other teams in their Division to bring home the gold, with 13 victories from 14 encounters in one bag. They had lost only to Cardinals in their return match of the Round-Robin 2-round League competition. They scored 1,202 points and conceded 956 for an average match-score of 86-68. They inflicted 5 blow-outs, including three centuries (103 vs Lions, and 107 then 103 vs Owls), and were crowned 1986 Division I League Champions! Eagles I then proceeded to knock out all who came against them to capture the 1986 Division I Knock-out Championship, completing the massacre with a 35 Pt extinguishing of Flames, 89-54. Eagles Intermediates Glide In: Following the second season (1984) in the life of Eagles I, an Intermediate (Division II) team was formed, debuting in DABA's 1984 Off-Season League in November that year. However, Eagles II flapped into the National League in April 1985. That team of eaglets comprised Leroy 'Peggy' Dover, Francis 'Zowèy' Edward, Anthony 'Tumbler' 'Fat Head' Emanuel, Lyndon 'Morals' Graham, Anthony 'Alcapoon' Green, Roland 'Monkey' Jean-Jacques, Roland 'PJ' John, Davis 'DJ' Joseph, Reginald 'Pappy' Monjerie, Ronnie Rolle, Tony 'Godzilla/Godzie' White, Steven Williams and Heskeith Winston. 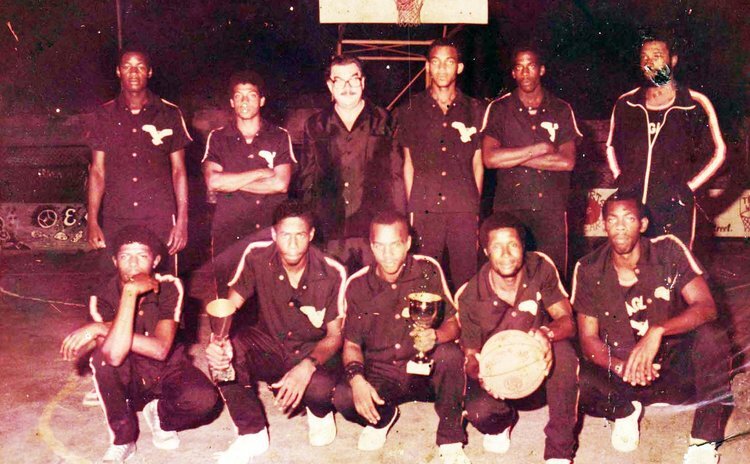 Eagles II contributed a short but impressive chapter in Dominica's basketball history books, playing "greedy" and grabbing all four Division II championship titles over their short life span. They secured double League & Knockout championships in 1985, then repeated in 1986! In the 1985 Division II League competition for example, the young Eagles finished the season with a very impressive 19 wins and 1 loss for Championship honours! Soaring on the thermals in their debut year, the ruthless Eagles II inflicted 9 blow-outs (games won by 24 or more points) in their 20 games, and that included five centuries: Against Rammers of Grand Bay (100-34); Castle Bruce (103-57); Lakers of Pottersville (110-57); Targets of Pointe Michel (111-67); and an 87-Pts mauling of Blue Jays from Fond Colé (120-33). In their unbeaten run of 14 victories to capture the 1986 League championship among the 15 Division II teams, Eagles II meted out at least six blow-outs, including three centuries (133-40 against Hawks, 123-40 vs St. Joseph and a crushing 133-38 to Dominica Grammar School. They amassed 1,119 points and conceded only 595 in that competition. Eagles' Eras End: The year 1987 was a very significant one in the lives of the 1980s Eagles. Firstly, after the 1986 basketball season ended some members of Eagles I parted company with the team that had just won two championships, joined forces with some of the members of the then disbanded Wizards and formed Running Rebels; the latter debuted in 1987. More importantly, nevertheless, Eagles I retained the 1987 Knock-Out Championship, defeating Running Rebels 84-77 in the Finals after losing the League Championship back to Cardinals. Meanwhile, Eagles II were nowhere on the scene that year neither was there any Eagles on the Roseau 1986-87 Off-Season League fixtures. It was disclosed that even with those accomplishments by the two Eagles teams combined: 1 League and 2 Knock-out Championships for Eagles I, plus 2 League and 2 Knock-out championships for Eagles II, some of the players within the large EAGLES nest wanted to form two senior teams. And so, amidst the bickering came the unfortunate dissolution of the short-lived Eagles after the end of the 1987 main basketball season.